We visited this museum in Beacon Hill on Joy Street. 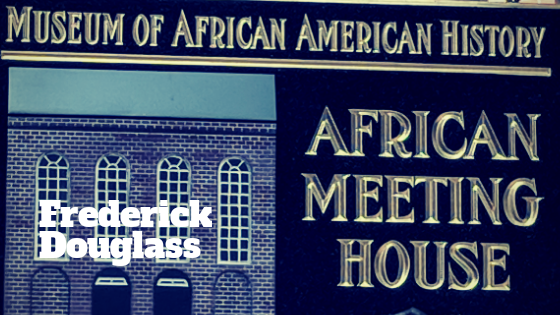 It is part of the history of free Black people who lived in this area in the 1700 and 1800s. What I liked most about this museum is that it only has one exhibit at a time. The current exhibit is about Frederick Douglass in pictures. Frederick Douglass started his advocacy at the time when taking a photo has gotten much cheaper. He used his image to shatter stereotypes about Black people. When you enter the exhibit it starts of with photos of Douglass as a young man. He is dressed impeccably. In his early photos he mostly stares directly into the camera, not smiling, with his hands in a fist, almost like he is daring you to see him less than a man. After Emancipation the photos change. His still does not smile but he has that elder statesman pose, looking off into the distance, his body language much more relaxed. Frederick Douglass is the most photographed person of the 19th century. He understood the power of the photo. He took minimal personal photos. During his lifetime, there was about four documented personal photos. Only two where he is smiling. Both of those photos were when he was of advanced age. He did not smile in photos because he wanted to add a counter narrative to the happy slave. I was deeply effected by this exhibit. I was struck at the power of the photos. I think most of us have seen a photo of Mr. Douglass. However, when you put all the photos in order, you can feel the power of his advocacy. He knew how to use this medium to change narrative of who Black people are and what we can do. I don’t have any photos since you are not allowed to take pictures within this museum. Please do look for photos that are within the public domain. Better yet, get thee to Boston and view this powerful exhibit. **This exhibit will run through December 2018.